The paper towels were the same, it just seemed like we were always buying more of them. And when I made a heap of cloths to use for milking Bella, we just started using them instead of paper towels. We have a stack of them, so you can just chuck them in the wash when they are dirty, and they can be single use if you want. Storage containers - we have various sizes of Tupperware vegetable storage containers and they really do help to keep vegetables for longer and organise the fridge better. We also have a collection of glass containers (most recently the Glasslock range from Biome Ecostores - affiliate link). I bought the set of different sizes and we never run out of containers. If all else fails you can always put a bowl or a plate over the food if you're going to eat it again soon. 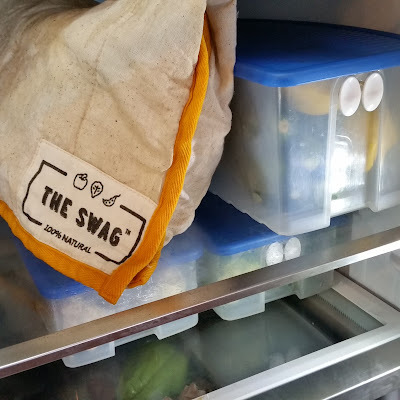 The Swag (also from Biome Ecostores - affiliate link) is a reusable padded bag that is designed for keeping vegetables fresh. 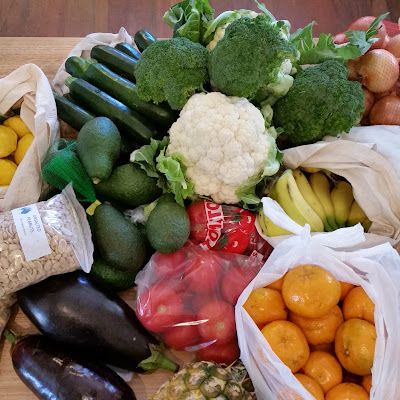 Biome Ecostores sent me a large Swag to try and I have found it great for storing larger vegetables such as cauliflower that previously would have got pushed to the back of the fridge in a plastic bag and gone all limp, because they never fit in the vege crisper. The Swag has kept these veges fresh for up to two weeks if I remember to keep the bag moist, so its definitely a good option if you need to store bulk amounts of vegetables. Beeswax food wraps (also from Biome Ecostores - affiliate link). Biome Ecostores sent me some of the Honey Bee Wraps (they also have vegan options available) and I love these! Not just for storing food in the fridge, but also for keeping fruit flies out of my fruit bowl, but still letting air circulate. I was amazed that half a cabbage lasted for three weeks in a beeswax wrap, I just kept cutting a bit off when I wanted it and wrapping it back up. This is a wonderful product and I need more than three of them! This is the best replacement for cling wrap as you can use them seal the top of any container or just wrap up lose items like half an avocado or a sandwich. Have you found alternatives to cling wrap or paper towels? Share your tips here! I have a Greenleaf Bag for storing veggies, Liz. We still do have cling wrap but I don't use it too often. I have thought of making some beeswax food wraps but I heard they stop sticking after a while. Just wondering how you dispose of grease on your food plates, without kitchen towels? I could give them up, if grease wasn't bad for our septic. With our roasting pans, I'll make the chicken food up with it, the next day, which includes bread-scraps. Mixed with some hot water, this gets most of the grease out of the pan, so I don't need kitchen towels. But with things like fried bacon and eggs, I have to wipe the plates with kitchen towels.